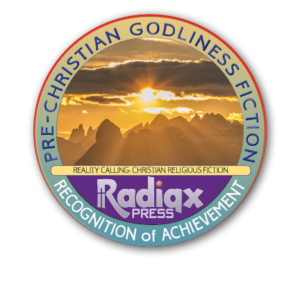 The Pre-Christian Godliness Award by Reality Calling is a badge used by the reviewers associated with Reality Calling, and the publishing house, Radiqx Press. It is awarded by the reviewer, at his or her discretion, to indicate that the book or books so awarded meet the criteria we have established for Christian Religious Fiction. 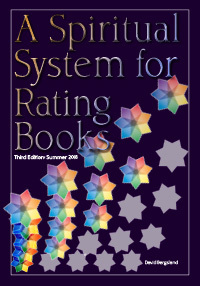 This is presented to books with level two spirituality in our rating system. Yet, they accurately portray Godly living at the Old Testament level, plus clearly revealing the Truth about the Lord and how he works. They can be post-Abraham or pre-Flood—anything from Genesis 1 up to, but before, the Gospels—or purely speculative, before the Messiah arrives. God has always made Himself known in His creation. But He rarely spoke to people. So these stories involve a tricky bit of fiction to remain Truthful. In addition, there must be specific references to the coming Savior/Redeemer and the Lord’s ultimate plan for His people. From A Spiritual System for Rating Books: The pre-messiah level: A large section of “Christian fiction” consists of Old Testament tales or stories on a legal level. Some, like the original Firebird Trilogy, are openly labeled pre-messianic by the author. In this case, we commonly find following the law is depicted as spiritual truth. There may or may not be a written record. Possibly, a prophet is present where the Spirit comes upon him or her and often leaves the reluctant prophet reeling. There may or may not be a priesthood, monasteries, a “divine right” king or queen, or any of a number of religious people. A large portion of these tales deals with speculation on antediluvian myth, Nephilim, giants, angels, demons, and the like. Scripture itself warns us about those tales and tells us to have nothing to do with them. This ranks right up there with tarot cards and astrology [which I was taught, when I was involved in the occult before Jesus revealed Himself to me, are either from before the Flood or from Babel]. They are not threatening. All legal systems have loopholes—everyone knows that. This is why most megachurches commonly teach from the Old Testament. People like the Law. The Spirit is too unsettling. Nevertheless, there are some excellent books written about this type of culture. We want to reward authors who take the charge to write edifying books seriously.